As day must follow night, so too must footage of cute animals be refashioned into mighty pop culture references. In this case, the source material was already pretty spectacular. John Oliver’s Last Week Tonight did a piece recently about the banning of cameras during the Supreme Court’s hearing of oral arguments. 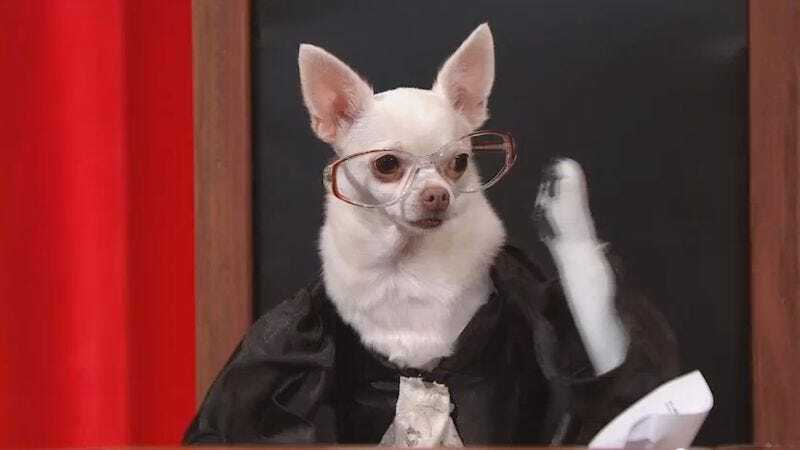 To point out the wholly arbitrary nature of how TV news tends to simply use poorly drawn caricatures of the court as a substitute for actual footage, Oliver presented a re-creation of the Court using dogs as substitutes for the judges and lawyers (not to mention a goose for the assistant and a chicken stenographer). Oliver ends the segment by pointing to a YouTube link where the show had posted 10 minutes’ worth of footage to be repurposed and used in any way anyone saw fit. It wasn’t long before an enterprising soul decided to edit the footage into the famous courtroom scene from A Few Good Men. It tracks fairly well, with the Tom Cruise dog getting in some especially well-timed paw gestures. If these animals are up your alley, a quick Youtube search using the hashtags #RealAnimalsFakePaws and #PuppyJustice will net you a host of other submissions. That dog playing Ruth Bader Ginsburg has “A-lister” written all over her.